To be honest not to much happened this week. It was more mundane than the other two weeks we've endured. There was a new batch of kids this time like we get every week and they already get along with the other kids. On Monday we did the usual routine of participating in activities such as sharks and minnows and where the wind blows. Then headed to the dock and fished, Kayak'ed. We had gotten about 1 crab that day which is strange because we usually have caught more than that but the kids still had fun overall. We ate lunch soon after and then went to the park where we had played games like man-for-themselevs and monkey tag. 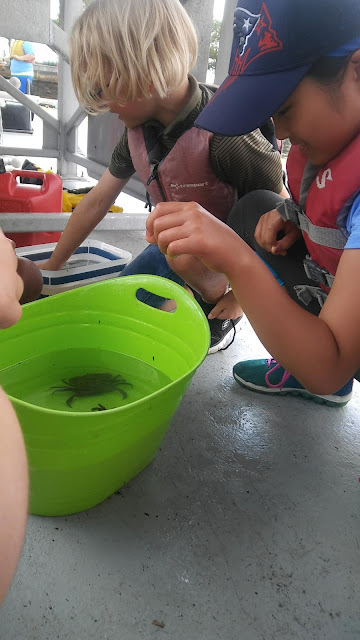 We proceeded to play capture the flag soon after and go to the dock again and did the same thing we did in the morning only we had caught more crabs. This was basically the routine for the 3 days I was there. The highlight was being called a favorite by a few of my campers, which was a nice feature for the week. We also caught a massive spider crab it was really huge! At least its the biggest one I've ever seen. Also we almost caught a fish. A kid named Alejandro had almost caught a fish twice the time he's been at the sailing center. He has the "Golden Touch" in a sense. The 2nd time was more close than the 1st because he actually got a fish on the hook. On Wednesday the same deal happened and not alot of excited things happened.